14 Passenger Executive Interior in tab leather seating, featuring a forward left hand club opposite a 2 place berthable Sofa with electrical oval table stowed under sofa, then a Dining Group with electrical table opposite a credenza with 1 foldable seat, and in the aft cabin, two 3 place berthable divans with luggage racks above left hand divan. Aircraft is equipped with Forward and Aft Lavatory and Dassault Jump Seat in the cockpit. 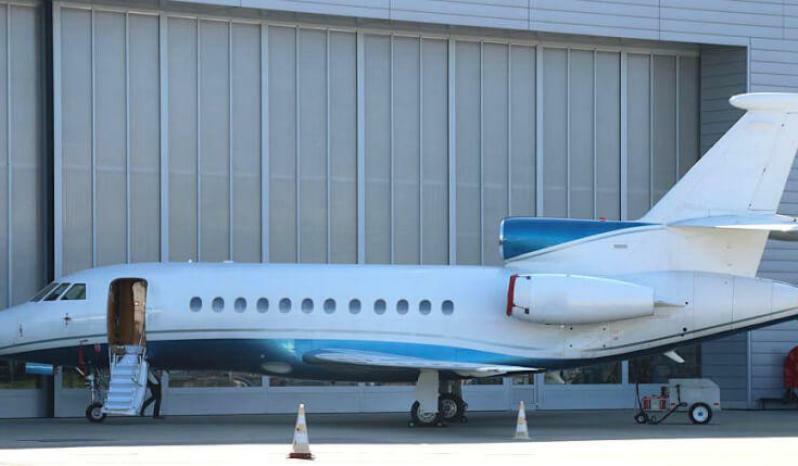 Upper fuselage is Matterhorn White, with blue accent stripe, and lower fuselage and upper engine cowl painted blue. 230VAC 50Hz static inverter, Baker cabin entertainment system with Audio International CD player, Entertainment Airshow 400, multi disc changer, multistandard DVD, multistandard VCR, Baker 15” plug-in monitor, 18” monitor FWD, 15” monitor AFT, 1 Rosen plug in 8,4” LCD monitor, TIA microwave oven, Nespresso Coffeemaker, pocket door between mid and aft cabin, Tail reco Lights, Batt ventilation for hot climate, enlarged oxygen bottle, 3ea. 6 men life rafts.